This Screen Protector Fit from TANTEK is For: Amazon Fire 7-inch Tablet(5th Generation),Not Fit for other devices. 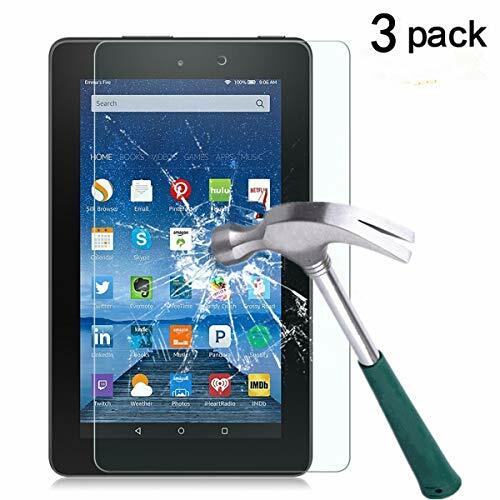 Please Note: - Due to the round edge of Amazon Fire 7-inch Tablet(5th Generation), the screen protector will NOT cover the full screen, but only the flat area. Perfect Design Perfect Protection: -Featuring maximum protection from high-impact drops, scratches, scrapes, and bumps. -Protects against sweat sweat and oil residue from fingerprints -Best Way to Maximize Resale Value -Bubble free Installation -Best Touch screen Accuracy -HD Display Clarity Lifetime Replacement Warranty Will Be Guaranteed: At TANTEK, we believe in our products, so no matter how long you've used it, we'll make a REPLACEMENT OR REFUND immediately if: - The screen protector does not match your screen size. - There are unremovable bubbles during the installation. - The screen protector suffer wear and tear during normal use (not including water damage or damage caused by abnormal use). Compatible with Amazon Fire 7-inch Tablet(5th Generation),Not Fit for other devices. NOTE: Due to the round edge of Amazon Fire 7-inch Tablet(5th Generation), the screen protector will NOT cover the full screen, but only the flat area.